Join Sunset Cycles as we celebrate the cycling heritage of Belgium with a special celebration on Tuesday, July 30th from 6 to 9pm. Farm roads…some packed dirt, some, cobble-strewn paths…connect lush farm fields and quaint villages, brushed by the warm sunlight in summer and washed clean by northern Europe’s winter rains. On these roads ride the cycling-crazed masses, particularly in Flanders in northern half of the small country. Spring classic bicycle races are punctuated by the yellow flags bearing the Flemish Lion, waving madly in the wind. When cyclocross season descends, the faithful join en masse in a wild celebration of wet sand, mud, and sweat. The Koppenberg. De Ronde van Vlaanderen. Liège–Bastogne–Liège: Icons of a cycling tradition unlike any other. And there are other, newer icons of the modern cycling world that Belgium has shared with the world. Foremost among these is Ridley, a bicycle brand that has become the country’s finest racing bicycle, tested on the cobblestones and in the heat of brutal competition on European cyclocross courses. Models such as the X-Night, X-Fire, and X-Ride strike fear in opponents eyes and create confidence for the person who rides them. Lazer Helmets, another Belgian cycling export, relies on experience in helmet manufacturing to produce some of the world’s best protective headgear. With over 90 years in the business, Lazer has refined their products to provide the best combination of light weight, safety, and comfort. On Tuesday, July 30th, from 6 to 9pm, you’ll get to experience what much of the world already knows: That the Belgians know a thing or two about cycling. 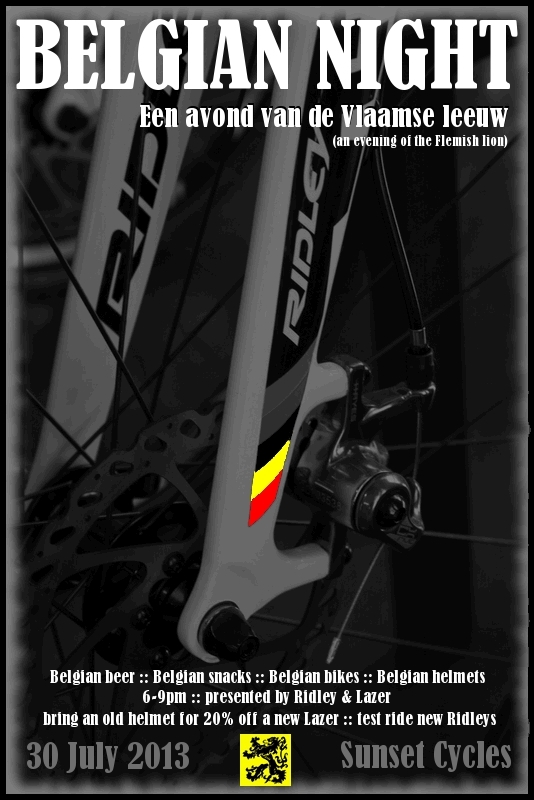 As you sample some delicious Belgian brews and snacks, you’ll have the chance to talk with Ridley and Lazer reps about their products and why they think you owe it to yourself to try their brand. You’ll be able to test-ride a Ridley and feel the responsive handling and power you can take with you to the cyclocross courses this fall. Talk to a local race promoter about their cyclocross race and get inside information on new courses and racing plans. Team Sunset members will also be available to share their stories of experience, which can be particularly useful for beginning cyclocross riders. Best of all, you’ll share in a celebration of Belgian cycling culture, perhaps even feeling for one evening that you’re eyeing the setting sun over Brugge instead of Beaverton. Don’t forget to bring in an old helmet to trade in for a 20% discount on a new Lazer helmet! Please accept this invitation to join us, Tuesday, July 30th, from 6 to 9pm.